Nae tae be confused wi Lisbon. 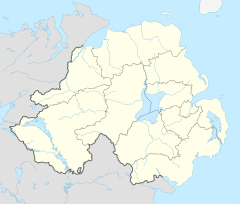 Lisburn (/ˈlɪz.bərn/ or /ˈlɪs.bərn/; prob. frae Erse: Lios, meanin "fort" + Scots burn, meanin "stream"; "fort o the stream") is a ceety in Northren Ireland. It is 8 mi (13 km) soothwast o Belfast ceety centre, on the River Lagan, which fuirms the boondar atween Coonty Antrim an Coonty Doun. Lisburn is pairt o the Belfast Metropolitan Aurie. It haed a population o 71,465 fowk in the 2011 Census. Umwhile a burgh, Lisburn wis grantit ceety status in 2002 as pairt o Queen Elizabeth II's Golden jubilee celebrations. It is the third-lairgest ceety in Northren Ireland. Lisburn is ane o the constituent ceeties that mak up the Dublin-Belfast corridor region which haes a population o juist unner 3 million. ↑ "Lisburn, County Down". Place Names NI. Retrieved 6 April 2017. ↑ "Census 2011: Population and Household Estimates by Local Government District for Northern Ireland" (PDF). Northern Ireland Statistics and Research Agency. September 2012. Retrieved 16 September 2016. Wikimedia Commons haes media relatit tae Lisburn. Lisburn.com directory o shops & services wi extensive history o the ceety. This page wis last eeditit on 21 Juin 2017, at 17:04.